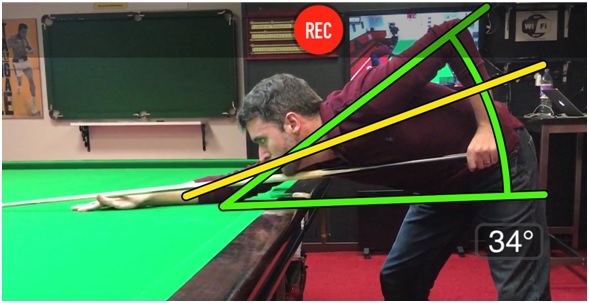 Following on from our blog post last week, Restricted Follow Through In Your Cue Action, And How To Solve It!, you may be interested to see pictures of shoulder positions which cause a lot of cueing problems with many club players. I had a client this week who presented three common elements of this interconnected stance and shoulder position, all of which are very often damaging to cueing at your best. 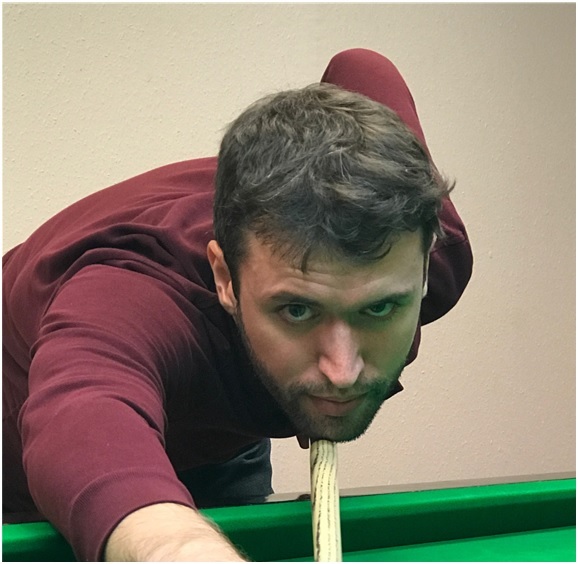 When Martin came into the session, the shoulder position was very flat as seen below. After our session, you can see his new shoulder position (34 degrees to horizontal in green) against his original shoulder plane in yellow. 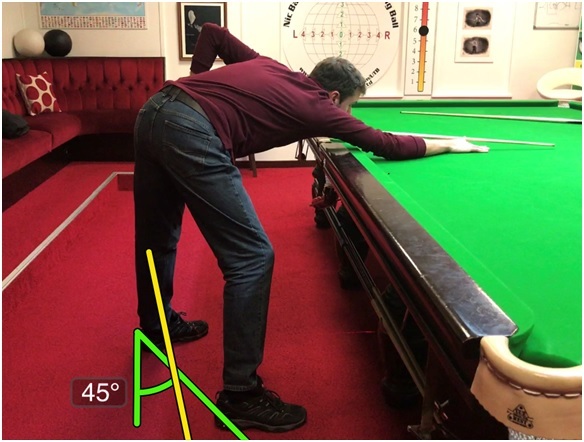 This has the benefit for putting more weight on the table for stability, and lifting the cueing shoulder above and away from the cue slightly to avoid obstructing the cue delivery. Whether the cue touches the chest or not during cueing is optional and down to personal preference. A newly optimised eye alignment is also included in this new set up – which is another topic. 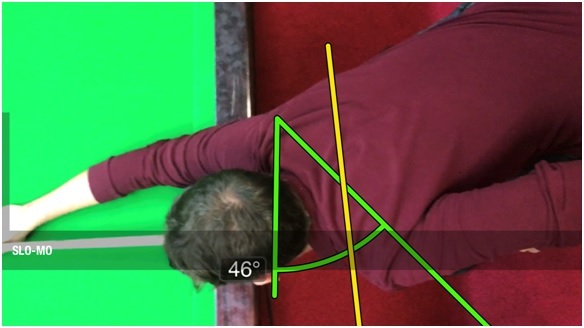 From above, you can see Martin’s new shoulder angle (46 degrees) relative to the line of aim compared to his original square position (in yellow). 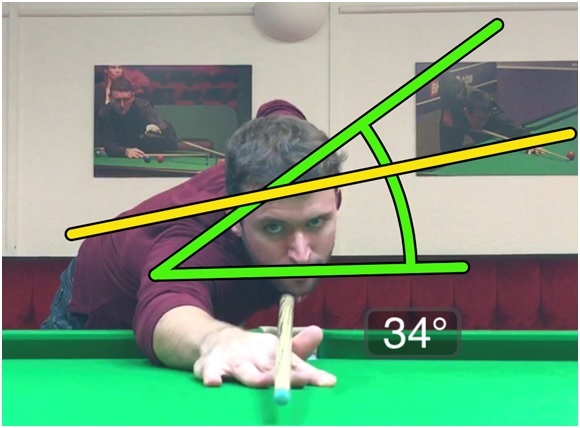 This more open shoulder angle extends the bridge hand forwards which makes aiming easier as one sees more of the cue. This rotation also moves the cueing shoulder backwards which pulls the shoulder more onto the line of aim. This makes straight cueing easier because the cueing arm is more on the line of aim, avoiding the cue moving round a corner on delivery. The stance was a large part of this more open shoulder position. Martin was originally standing in the intuitively correct (but often unhelpful) ‘square’ stance position. Opening up the stance by pushing the front foot forwards make the new shoulder position much easier to attain because feet, hips, and shoulders are all a similar angle to the line of aim. The body finds this position easier to adopt than having a square stance and rotated shoulders. Finally from the cue side of the technique we see how the shoulders are pointing more so (34 degrees in green) to the ceiling as opposed to Martin’s original flat position indicated by the yellow line. The yellow lines in the diagram represent very common causes of cueing errors in club players below 40 break standard – check your technique to see if you do the same and have a go at increasing your shoulder angles. See what happens and let us know the results in comments below!